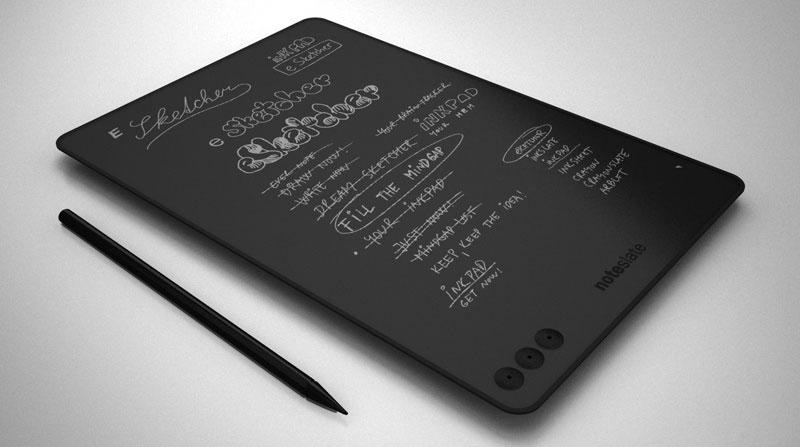 Yesterday I did a post featuring this noteslate device scheduled to release this summer. If you missed it, it's basically an e-reader (think kindle or nook) with a paper-like display that you can write on- essentially a digital notebook. Doodles, ideas, scribbles, and random notes can be saved and downloaded later. NEED. Right? Right. So why did I delete the first post? Well according to several articles online as well as commenters on the product's facebook fanpage, this awesomely awesome device MIGHT NOT be real. I guess there are scams out there that lead you to believe in an upcoming product so that you'll sign up for updates and give them your e-mail address--- which they'll then sell. Suspicions arose because detailed product images and specs were yet to be seen- until today. The website has been updated and I'm still not sure how real it is, but there are other techie blogs already hyping this thing up... and they'd know best, right? Anyways, I wanted to save any of my readers from potentially falling for a scam, but the idea of the thing is cool and now there are more people talking about it, so I guess we'll just have to wait and see!